Click on picture to go to Article. I thought the above quote by Billy Baldwin was very fitting to describe the exclusive outdoor furniture collection which was originally created by Walter Lamb for Brown Jordan in the mid-1940s. 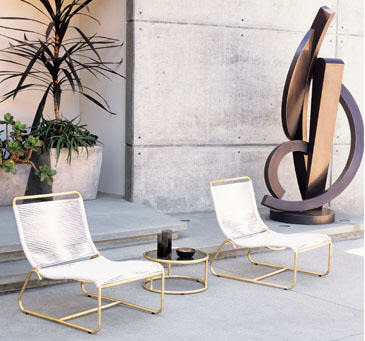 Just after World War II, the furniture designer Walter Lamb, began experimenting with bronze and copper tubing salvaged from sunken naval ships at Pearl Harbor and constructing prototypes incorporating canvas and yacht roping. The result was a collection defined by it's sculptural curves, sturdy construction and superb comfort. Today, Walter Lamb's furniture is still as timeless as ever and is still handcrafted to Lamb’s rigorous specifications by Brown Jordan. For modern use Brown Jordan has replaced the bronze pipe with weatherproof brass, which over time will develop a rich patina. Vintage pieces of Lamb's are now selling at starting prices of $5,000.00. Which goes to prove that nothing that is well designed and well crafted is 'ever out of style'. 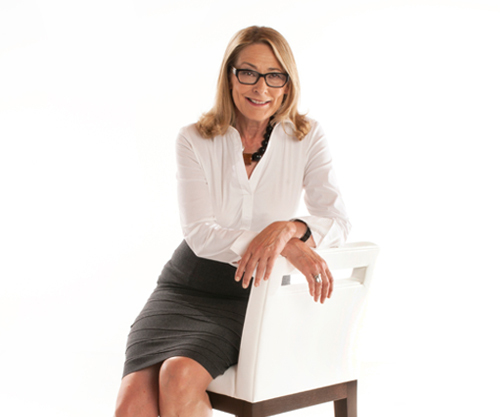 I recently received Michael Taylor's new book, Michael Taylor Interior Design. As most of you who read my Blog know, I was greatly influenced my Michael in my formative years in Design School. Not much has been published on his work outside of a few articles in Architectural Digest, so this has been a highly awaited book for me. Michael Taylor was dubbed the "James Dean of Interior Design" by Diana Vreeland and "the best decorator in the United States " by society and fashion photographer Cecil Beaton. 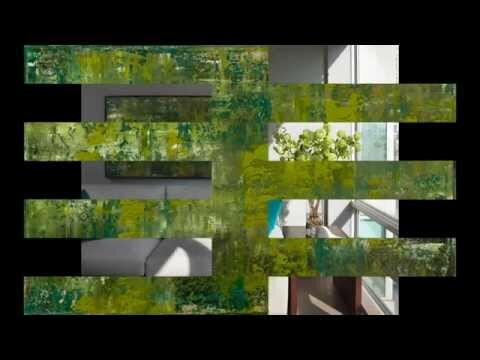 Michael Taylor revolutionized interior design in the 1970's and 1980's with the "California Look". Taylor brought the outdoors inside with neutral palettes, natural light, large-scale furniture, and organic elements, especially stone, slate, wicker, and plants. His interiors expressed his love and appreciation of California and the outdoors. They were casual, comfortable, uncomplicated, and free of clutter. So much of what he created, we now take for granted, but he started it all. Taylor believed that nature was man's best friend. His first shop was located in San Francisco and a notable neighbour on the same 500 block of Sutter Street was Williams-Sonoma (circa 1956). Taylor was particularly taken with the imported oyster baskets that were originally used to transport oysters from the coast of France to Paris. Their heavy natural weave appealed to Taylor. They had a profound effect on him. He began to use them as vessels for towering plants and trees - fishtail palms, ficus, and Zimmer linden - creating a look that became fundamental to his interiors. 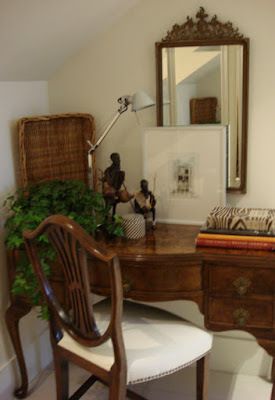 He believed that plants prevent "a room from feeling over-decorated", "soften the light" and "help a room breathe and feel alive" and thus initiated "the plant in a basket craze" with these baskets that he purchased from his neighbour - Williams-Sonoma back in 1956. Taylor was a proponent of white walls and ceilings. 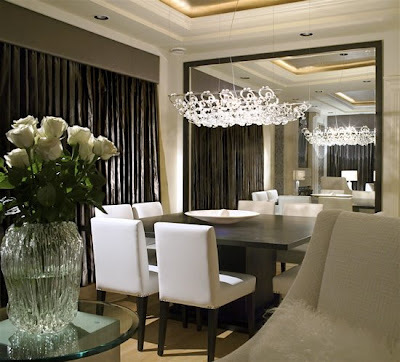 His interiors glowed with a specially formulated "Michael Taylor White". (Never pure white "Michael Taylor White" was a mixture of warm colors with a beige tone.) Although Taylor's rooms were known for their neutral palette, he always "advocated a strong secondary color and repetitive use of printed fabrics for a 'certain purity' and bold unified effect." 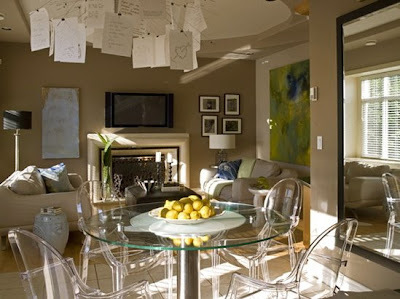 He also clarified that "There is a tremendous amount of color in my rooms, but there are not many colors." In his formative years of his career he came to idolize the renowned decorator Francis Elkins (1888-1953), who has been quoted as being "one of the guiding forces in the whole development of what is the American style today". Taylor saw himself as Elkin's greatest disciple, and he believed completely in her genius. Michael Taylor died at the young age of 59 at the prime of his career. His work and the "California Look" that he invented continue to influence interior design today. 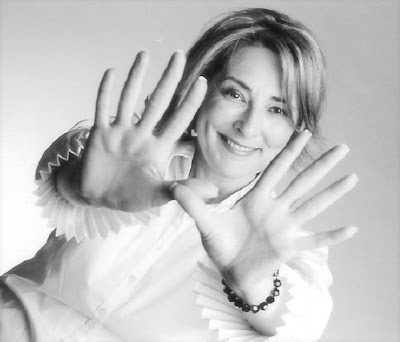 The forward in this book is written by his good friend Rose Tarlow, herself a Design Icon in her own lifetime. Michael Taylor was known for his extravagant shopping marathons which are legendary. When Taylor entered a shop, he always paused at its threshold and scanned the entire showroom. He had the reputation of being able to home in quickly and precisely on the finest pieces of inventory. He "never forgot beautiful things. He constantly absorbed everything he saw and banked it as a source of reference." He imparted his depth of sensitivity to his clients, and made them aware that "it's got to sing and talk back to you, and be A plus, plus if it crosses the threshold" of your house. At Taylor's death in 1987 he had amassed an enormous trove of beautiful objects. Their was an auction of 1355 lots, including his clothes, books and orchids. 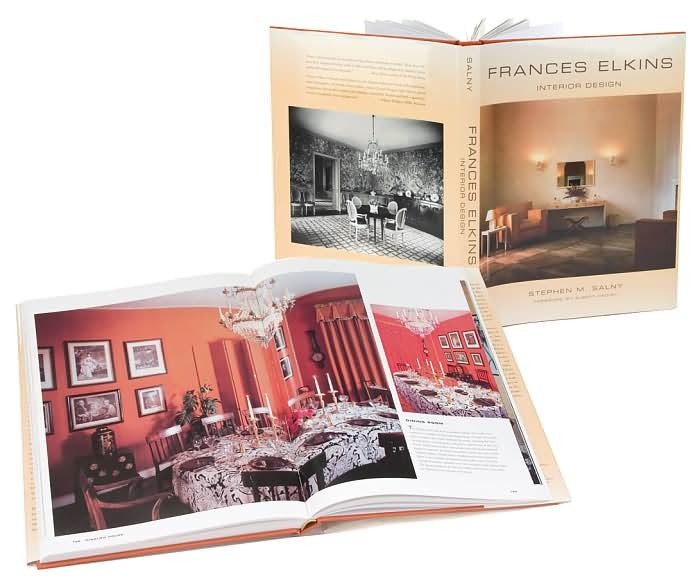 The following is the official auction catalogue with several color photographs of the furniture and objects in their rooms and in place in the garden with a nice foreword by Paige Rense, Editor-in-Chief of Architectural Digest. I got my copy from the Bill Hall at High Valley Books. Interesting Statistic: House and Garden magazine devoted a record eighteen covers and more than one hundred articles to his work over a period of thirty years. A thing of beauty is a joy for ever: Its loveliness increases; it will never Pass into nothingness; but still will keep A bower quiet for us, and a sleep Full of sweet dreams, and health, and quiet breathing. A favourite picture and a favourite poem of mine that I am linking together to wish you all a Happy Weekend. Janus et Cie makes the ultimate in teak umbrellas. I am fascinated by the attention to detail and craftsmanship they put into their umbrellas. 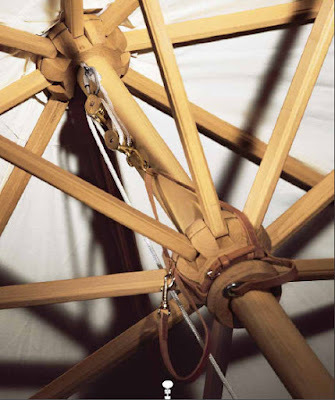 The brass pulley assembly and the leather strapping is what makes this teak umbrella a work of art. I like to refer to it as the 'Hermes' of umbrellas. How wonderful to sit under this umbrella and gaze up into the beautiful design of the interior. Janus et Cie's teak is plantation harvested and is truly an investment that will give years of pleasure. Care and Maintenance for Teak: Teak is a wood that has traditionally been used on ships because it is strong and durable, and because of it's ability to stand up under humid conditions. Teak is one of the best woods for outdoor furniture and umbrellas because it requires little or low maintenance depending on the look you want. If teak is left untreated it will weather to a beautiful silvery gray patina, while retaining its strength and durability for many years. Weathering can be accelerated by washing the teak with a mild soap solution and the addition of a teaspoon of bleach to a gallon of water. Rinse with clean clear water. If you want to keep the natural beauty of teak, treating it with good quality teak wood care products will enable it to keeps it's characteristic golden honey golden color. If oil is applied to teak, it must be done to a perfectly clean and dry surface. Proper care and maintenance of your teak umbrella and teak furniture will enhance its beauty for years to come. Last weekend was my Birthday and I was presented with this exterior rendering of my Townhouse by Michelle Morelan. Apparently she was busy out front of my place the week prior taking photos to get her rendering just perfect for me, and was concerned that I would see her through the window and ruin her surprise. Thank-you Michelle, I was totally surprised and I love it!!! PS It was a good thing that the leaves were not out on the tree in front or else it would be hard to see the facade. Meanwhile, we're still patiently waiting for Spring here in Vancouver. A canopy bed is a decorative bed similar to a four poster bed but with a top to it. A typical canopy bed usually features posts at each of the four corners extending four feet high or more above the mattress. Ornate or decorative fabric is often draped across the upper space between the posts of the bed and a solid swath of cloth may create a ceiling, or canopy directly over the bed. The modern version of the four poster canopy bed is often left undraped. Canopy four poster beds make a dramatic design statement for the Bedroom. The canopy four poster bed came into existence more from practical purposes than that of extravagance or decadence. The the earliest incarnations were probably beds of common people seeking an additional layer of shelter and warmth beyond that of a less-than-impenetrable thatched roof. Canopy beds with curtains that could completely enclose the bed were used by lords and noblemen in medieval Europe for warmth and privacy, as their attendants often slept in the same room. Please take the poll in the right hand column and let us know which is your favourite Four Poster Canopy Bed. 1. 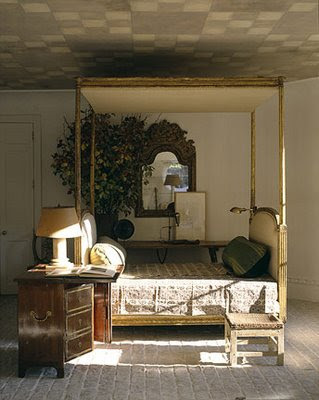 Top Picture - An antique four poster canopy bed by Stephen Sills Associates. 2. Viceroy Mayakoba features this distinctive four poster canopy bed with a canopy of woven reed textile. four poster canopy beds like this in colonial hotels and residences in the four corners of the world. The distinctive "bell or square top" was originally conceived for attachment of mosquito netting. 4. Bodie and Frau Four Poster Canopy Bed is Perfect for draping or leaving open & fresh. 5. 'Turner' Four Poster Canopy Bed in Natural Cherry by Restoration Hardware. 6. 'Willa' Four Poster Canopy Bed Oly Studio. 7. 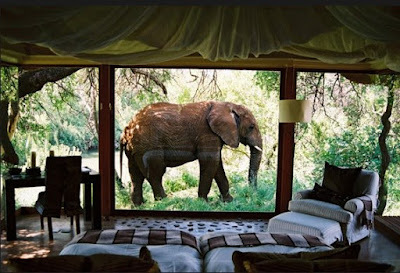 One of my favourites is the ultimate 'Daydream' Four Poster Canopy Bed from Dedon. It is designed for outdoor use, but I think that it could make the transition to indoors quite nicely. 8. 'Valois' Four Poster Canopy Bed from Niermann Weeks in Venetian silver leaf with antiqued mirrored panels. 9. A Huanghuali Six-Poster Canopy Bed with Latticework Railings, Jiazichuang. 10. 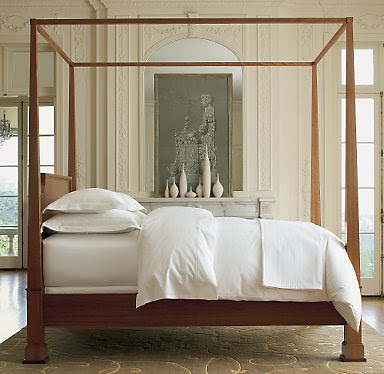 'Arezzo' Four Poster Canopy Bed Richelieu Mahogany by Niermann Weeks.